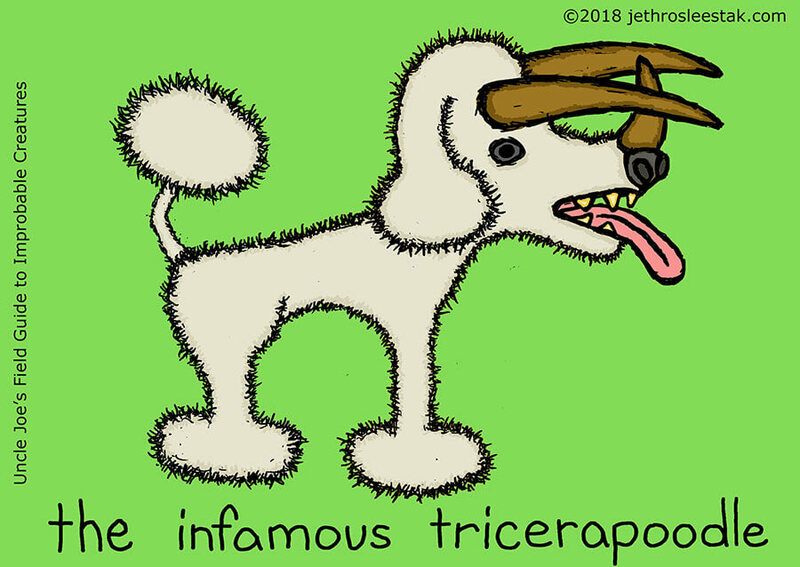 The Infamous Tricerapoodle inhabited France during the Cretaceous Period. Supposedly. Let’s just say that not everyone accepted Dr. LeFloop and his questionable fossils, some of which were clearly made from paper mache and plaster while others were parts of marble sculptures of varying degree of antiquity. Nevertheless, the debate in France over the authenticity of the “fossils” raged for decades, fueled by chauvinistic nationalism and attachment to the poodle as a symbol. Of all the many fist fights between members of France’s prestigious Academy, the only one to involve more than 12 persons was the melee that occurred during the debate over the Infamous Tricerapoodle.